This year I have fished probably less than ever before but I have managed to achieve one thing, I built a canoe. Drifting on water would be a new found perspective that had an appeal and the urge to construct something was prevalent. The process of building the canoe and why I ended up doing it is written up in issue 11 of Fallon’s Angler along with a rather good cover but I will refrain from saying anymore while I gently blush! After a few short trips on the Lea in the summer myself and a friend Greg decided to make one last trip of the year, to paddle along the Suffolk Stour in the autumn, (personally my favourite time of year). I knew very little about the county or the river despite making many visits to Portman Road over the years as a life long supporter of Ipswich Town. For both of us this would be a voyage of unknowns and an opportunity to load up the canoe and try it out before I plan a longer trip next spring. We set off a day after southern England was hit by the aftermath of hurricane Ophelia which whipped up the Sahara sands, a Ray Bradbury’esk atmosphere cloaked the land in an orange haze as we set off from Bures on the Essex/Suffolk border. Our journey was to be around thirteen miles with a stop off overnight on a small campsite that nestled next to the river. We packed light but made sure we had good provisions; wine, whiskey and food, our campsite had a farm shop and 28 days old steak was offered up to our open fire in the evening cooked on my old steel pan, we were alone, we were the last campers of the season. The night was mild but by sunrise light rain started to fall which slowly became heavier throughout the morning. Over the two days we had the Stour to ourselves aside from the occasional dog walker and one lone angler who sat motionless in the early morning drizzle of our second day. He sat still, an elderly man who’s posture resembled that of a heron transfixed on the water, mutual respect was exchanged in a silent nod as he waited for us to drift past so he could once again be alone with his thoughts as we headed on towards Stratford-St- Mary. The Tuesday Swim’s 100th post. When I started The Tuesday Swim I didn’t quite know how long I would be writing this blog. From the beginning I wanted to do something that had a sense of originality and held a captive audience even if it was for a select few. I was never a fan of reading about someones day-to-day captures unless the writing or circumstances were exceptional. We all go fishing for different reasons and I didn’t want to preach to the reader about my personal angling triumphs, anyway to be honest they are too few and far between these days! I guess for me I am interested in exploring the feeder stream rather than the main river, the less obvious is more compelling and its quieter, there is no shouting about it here. Because of my modest writing skills I made a conscious effort not to become overly romantic, flowery or down right clever, instead I have just tried to write my blog in plain english…keep it simple and not to plagiarise others with more natural talent. The most important bit was to include original content and keep it fresh. 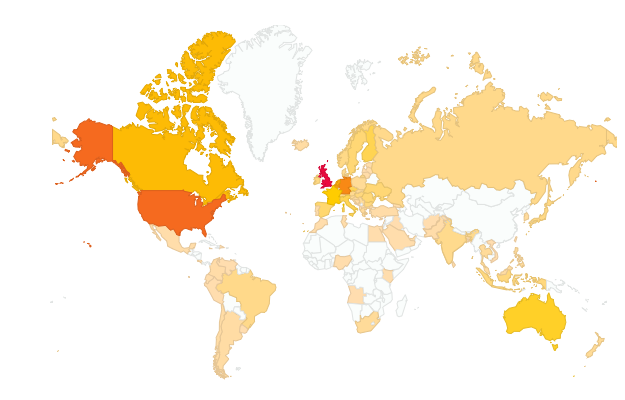 What I have really enjoyed is the feedback from like-minded anglers (and non-anglers) here in the UK and overseas (I need to work on those african cousins, see the map below) who have appreciated the blog by following, commenting, or just simply reading it. This keeps me looking for new material to write about or photograph…always a pleasure never a chore. For now a big thank you to every reader as the tuesday swim sets sail to take on the sea and a chance of a spring/summer sea bass…coming soon!